You can still give the lawn a feed to help combat stress but only allow Potassium in small doses, low nitrogen and iron. Grass will greedily take up all the Potassium you give it so check the instructions on the pack before applying. Leaves need to be swept off the lawn and they make good leaf compost. 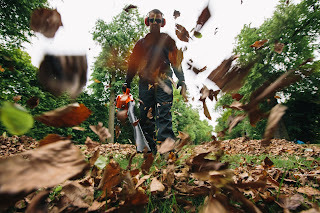 If you have a garden tractor with a sweeper it will make light work of collecting the fallen leaves on lawns and drives. The PTO could also drive a salt spreader and you might even fit a snow plough ready for action. Which brings us to servicing your tractor or mower. Now being a good time to get them booked in, oiled and maintained, and store dry if the mowing is done for the winter. Lawn edges can be trimmed up and any overhanging shrubs pruned back to help prevent bare patches. Consider the condition of your lawn, looking for any signs of disease. One of the commonest is Fusarium patch – areas of dead grass that is water-soaked and showing a ring of fluffy white or orange/brown mycelium. Avoid Autumn and early Spring fertiliser if you suspect it, and treat it with the correct fungicide. If you have been making a new lawn and laying turves you can do this during November so long as it’s not too wet or the ground frozen.